Sept 21, Friday night Jazz with Pam Douglas, early evening, free admission. There are many ways to enjoy TAG Gallery's September exhibits in 2018! 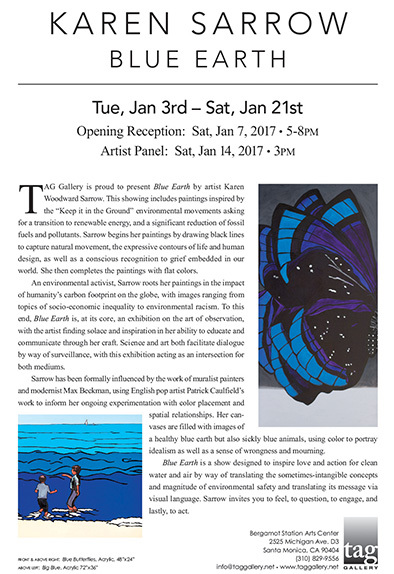 Karen Sarrow’s new exhibition entitled FEM is comprised of a series of paintings depicting political struggles and environmental activism. Themes of human vulnerability permeate the FEM series of paintings, to emphasize that the life of the body is a physical reminder that we only have one earth to protect. In the upcoming large-scale painting of FEM, Sarrow links the abuse of women and the feminine with corporate and government abuse of the earth’s environment. The central image of the feminine is one that Sarrow has long waited to represent. The Earth, as an expectant mother, exploited and suppressed by these entities, but, as with the feminine, will ultimately not be over-come by suppression. Exhibit Opening Reception for Pam Douglas, K Ryan Henisey, Boris Litvinov, and Karen Sarrow Saturday, September 1, 6pm - 10pm, free admission. September 15, 3pm - 5pm Artists Panel, free admission. Finding Depths Series: Self-Care with Therapeutic Oils, Acupuncture Sound Bath with Guided Meditation, Drawing Out Dreams Workshops, and more. RSVP at Eventbrite: https://healing-arts-collective.eventbrite.com Suggested Donation. TAG Events include open Friday nights in September, staying open until 9pm. There are so many things to say, so many people to thank, so many good friends we now love from NJ, and who know we are not saying good-bye. Our 5th grade son graduated today and that was an amazing event for all of us. Today we will send our South Korea Town (SOKO) Studio lease in the mail to experience in July. More news soon. Happy 4th of July! Pleased to find out one of my jobs this week is to secure travel for our family to Philadelphia this July for the Democratic Convention to help nominate Bernie Sanders. Sanders is the only President with a shot at revolutionizing our country to make it more accountable, ethical, humane and peaceful. No other leading candidate has these goals. Update: We'll be there in spirit; we can't make the Mon/Tues scheduling. The exhibition we were planning for early June has been postponed indefinitely. We got off to a good start, but we did not get enough commitments to justify the amount of work it would take to pull off a significant exhibition. Hopefully, we can build on the work we've started and create an exhibition that will benefit humanistic art, in L.A. or NYC. 2017. Another author and accomplished illustrator who includes diversity in her work is Elizabeth Sayles. I really enjoyed and recommend her recent illustrated book Anne Frank's Chestnut Tree by Jane Kohuth. http://amzn.to/1uCzBrP And I've preordered What Mary Jo Shared. I've been inspired to publish old artists books I made and create new books for fun and to market my own work.